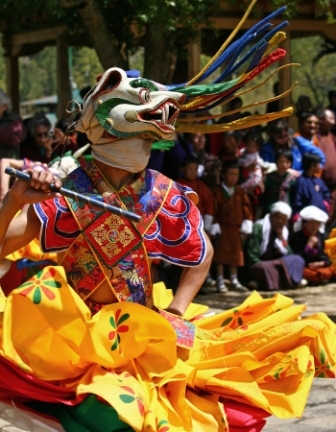 The festivals of Bhutan are key religious events that depict true stories of Bhutanese life. These celebrations take you to the heart of the culture of the last Himalayan kingdom. Year after year, more and more travelers are being charmed by the authenticity and hospitality of Bhutanese people and the richness of its culture. Bhutan’s admission in to the UN in 1971 enabled the country to become more open to the modern world. However, the kingdom of Bhutan places great priority on the preservation of its religious and cultural heritage that has been passed down the generations for millennia. This is what makes this Himalayan abode so unique. A former protectorate of British India, the country is now moving towards democracy and independence. The people of Bhutan celebrate religious holidays in a joyous and fervent manner that befits its moniker of “The Land of Happiness”. In fact Bhutan was the only country in the world to officially measure the ‘Gross National Happiness’. Dancing, singing, music and masquerades: the arts are honored as a tribute to the legacy of ancestors and Buddhism. These colorful festivals take place in Dzongs temples across the country and leave those who have the unique opportunity to attend charmed. If you plan to travel during the festive season, be sure to book your place of choice several months in advance as the hotels are sold out early in the year. The influx of tourists, although relatively low compared to neighboring countries, requires a significant and unusual management of logistics in this country nestled in the Himalayas. Buddhism plays a key role in the culture, ethics and social development of Bhutanese day to day life. Attending at least one of the festivals should be a must on every traveler’s agenda. Imagine a festival, off the beaten path somewhere on a mountain, in the intimacy of a village where the reception will be complemented by the serenity and beauty of the place. Travelers can focus their itineraries on less frequented cities or even villages such as Mongar, Haa Valley, Gasa, and Lhuentse, rather than popular destinations such as Paro, Thimphu and Jakar where accommodation gets booked out months in advance.